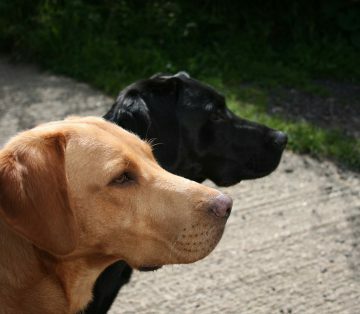 I am off in the caravan again, Lynnie and Dexter have stayed at home so Crosby and I are travelling solo for a few days walking on Exmoor. Our base for this trip will be the Caravan and Motorhome Club’s Minehead site. 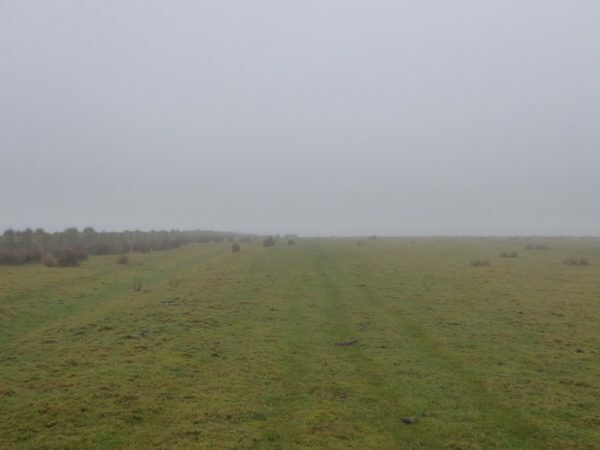 Despite being a frequent visitor to Somerset I have done surprisingly little walking on Exmoor. Normally my default walking has been on the Quantock and Blackdown Hills. 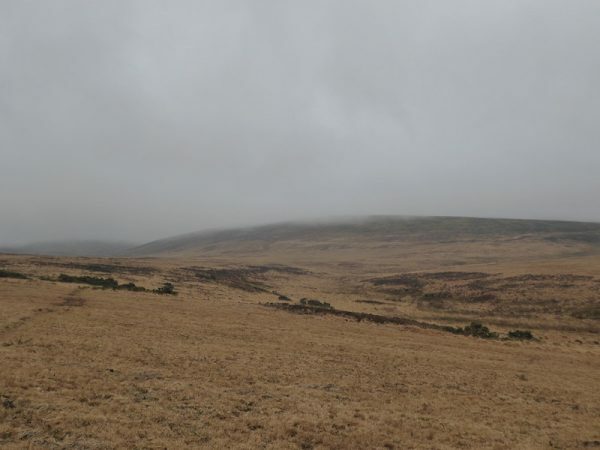 So on this trip I plan to explore the moor in more depth. The starting point for today’s walk is the parking area besides the B3223 north of Simonsbath (grid reference SS767410). 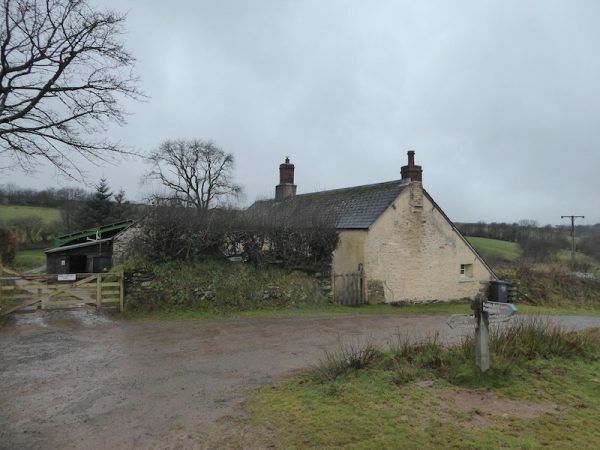 I leave the car park via a gate following the route of the Two Moors Way towards Exe Head. 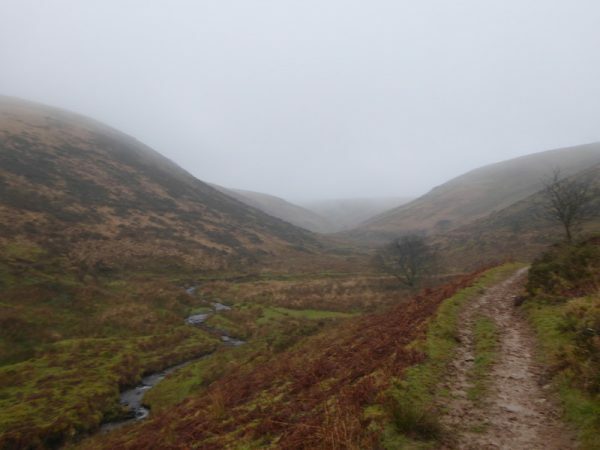 As I head steadily uphill the moor is shrouded in mist. 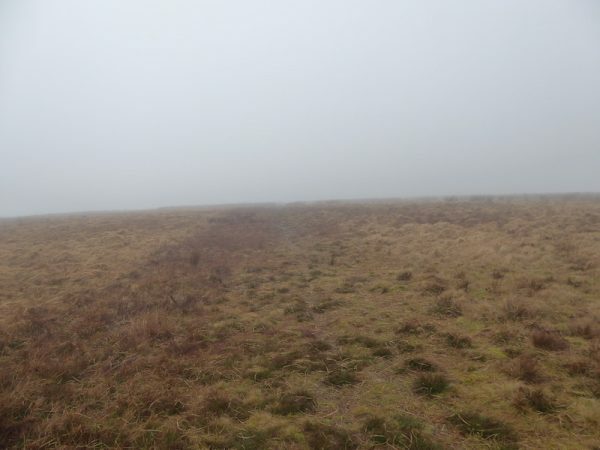 I am conscious that this is an area I am unfamiliar with and of the dangers of walking on moorland with peat bogs, so I have decided that if the visibility continues to recede I will turn around. 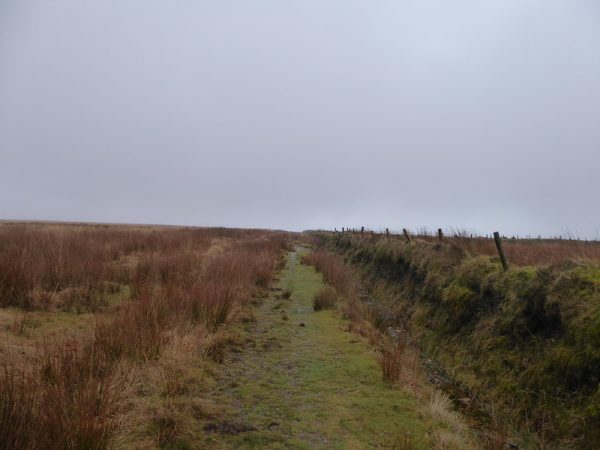 After following the fence line for a while the route is signposted across the moor, initially it is clear where I am heading but after a while it becomes more challenging to determine the exact route across Dure Down. 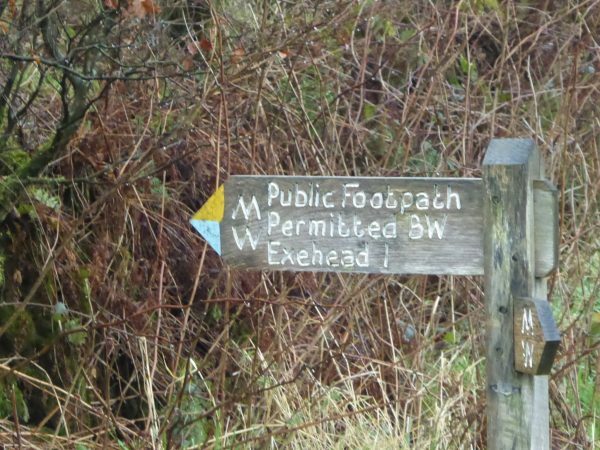 I head in a north-westerly direction towards Exe Head and it is with some relief that I reach a stony track and turn left to reach Exe Head. The route along the track is now easy to follow with the line of a fence on the right. Continuing along to reach a gate the track becomes grassier with the odd boggy section. 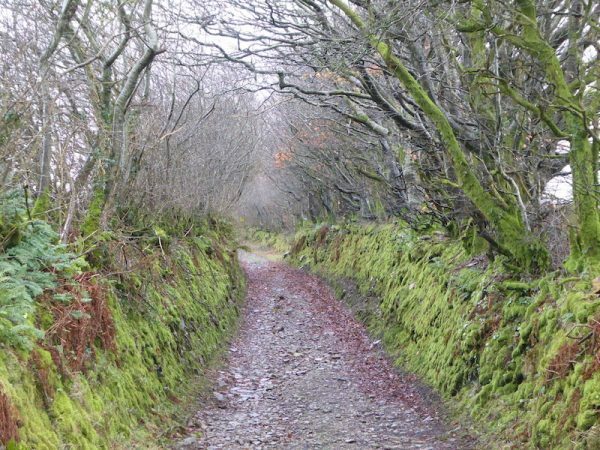 Soon after going through a second gate I reach the point where the Macmillan Way heads South but the route I plan to follow is straight on along the Tarka Trail path. 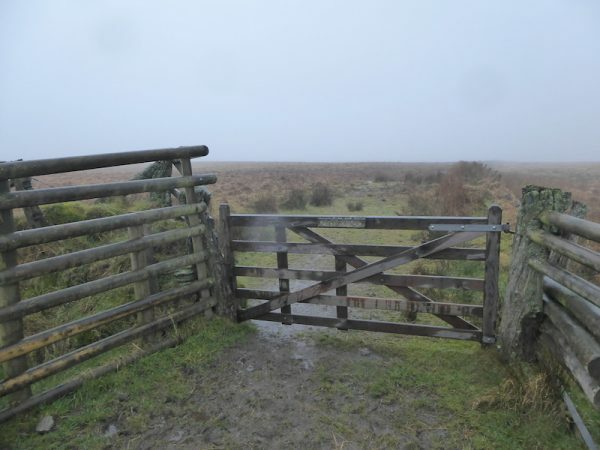 However, first I go through a gate on my right and negotiate a very wet area to join a path. 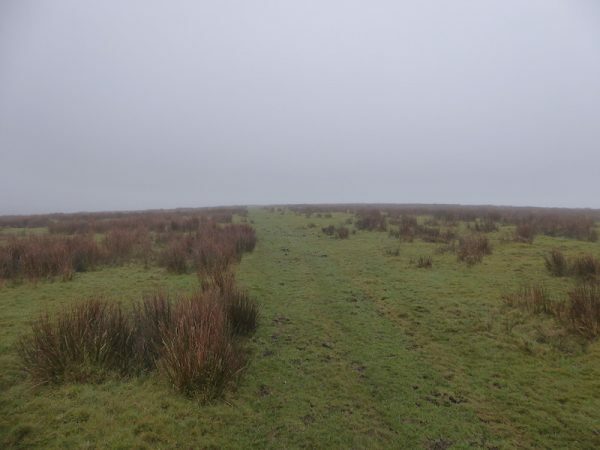 A sign warns that this section of the moor has deep peat bogs so I carefully follow a well-worn path towards the trig point at Chains Barrow. Even with my careful approach Crosby manages to find himself in a small but deep bit of bog on the route of the path. I am thankful he is on a lead and quickly manages to get out, but it is a reminder to be even more cautious. 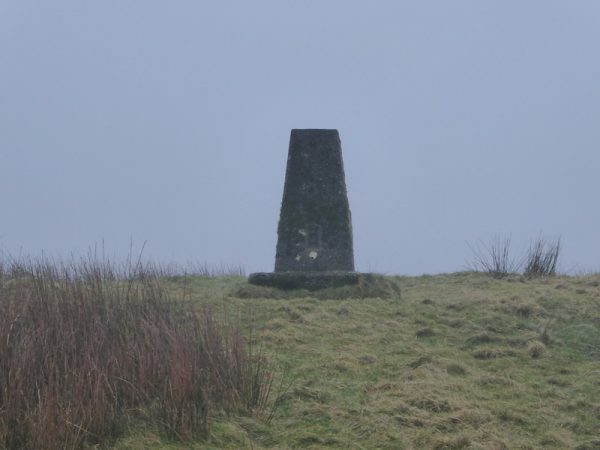 Having bagged my 128th trig point I turn around and head back to the gate to re-join the route heading west along the Tarka Trail path, once again with the fence line on my right. 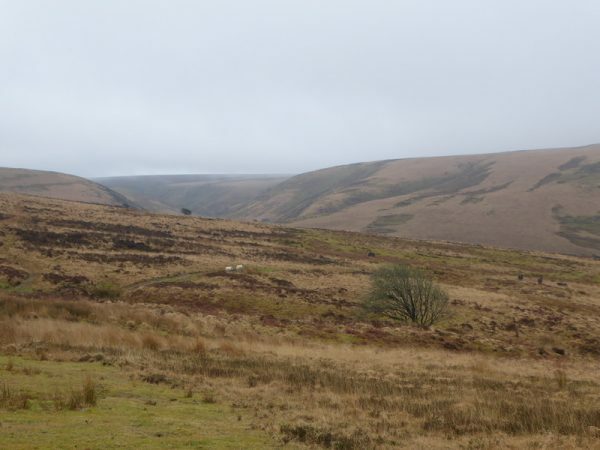 This area of Exmoor is known as the Chains and I later see it described by others as a wilderness and a wild spot. 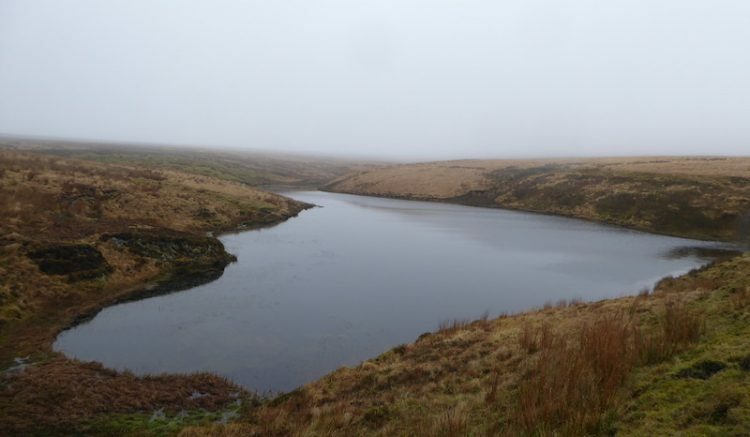 With the low visibility I am grateful to be following a clear route and soon reach Pinkworthy Pond, or Pinkery as it is known. 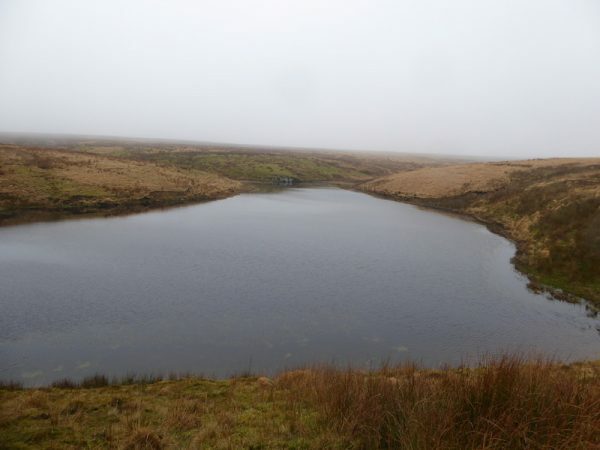 Local landowner John Knight created the pond around 1830 by building a dam across the River Barle. Apparently the pond can be drained by removing wooden plugs at the base of the dam. The purpose for the pond is unknown, but it does make a stunning feature. 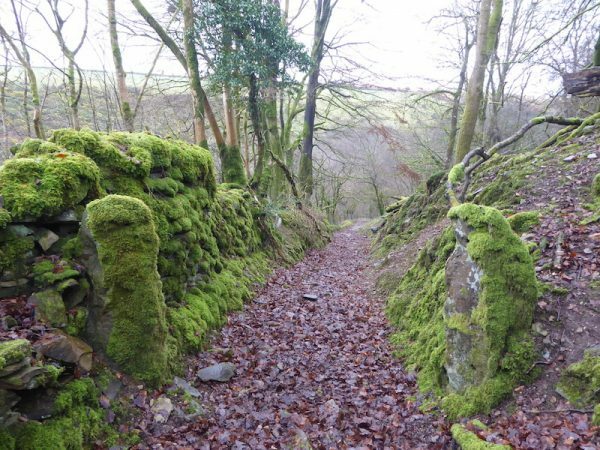 I stay on the Tarka Trail until Woodbarrow Gate, here the trail turns south, but I go through a gate to follow a faint path north across the moor. I keep checking to ensure I stay on the right path, previously I have found it easy in such situations to follow a sheep path believing it is the footpath. Such a mistake is easily rectified in good visibility, but when you can see less than fifty yards ahead it is more challenging. 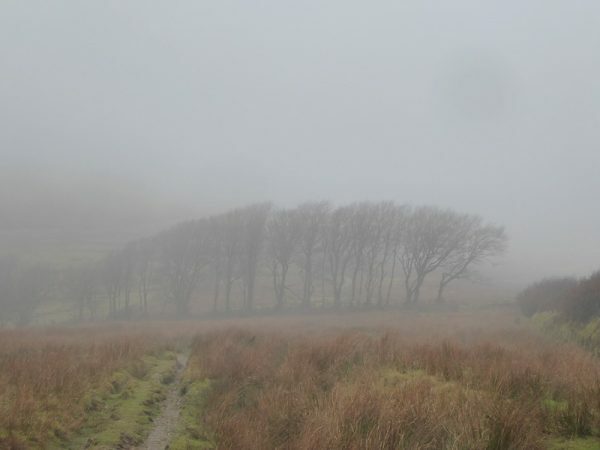 Thankfully the visibility improves and I can see a clearer path as I head to trees and Saddle Gate. After going through the gate the path is clear and as I continue downhill the visibility improves. On reaching the farm at Shallowford I turn right on a path signposted to Furzehill. 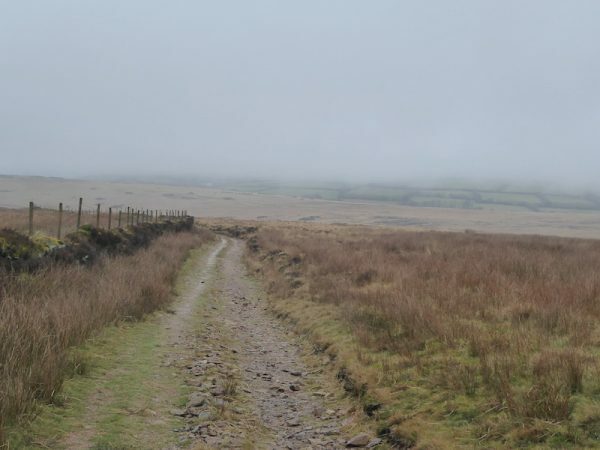 This clear path heads across Ilkerton Ridge, now that the mist is clearing I get some idea of the remoteness of the moor I have just walked across. I leave the moor through a gate besides a cottage and continue along a lane to reach a tarmac road and continue through North Furzehill. I take a bridleway on the right signposted to Hoar Oak. The route heads along a track to enter fields of pasture and then turns left through a gate to follow a track. 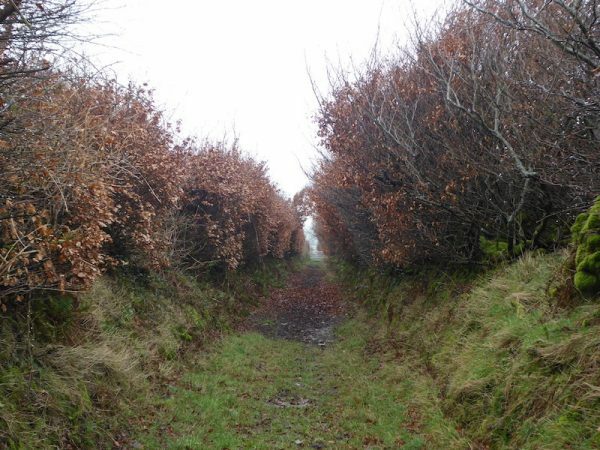 At a junction I turn right along a beech hedge lined track. 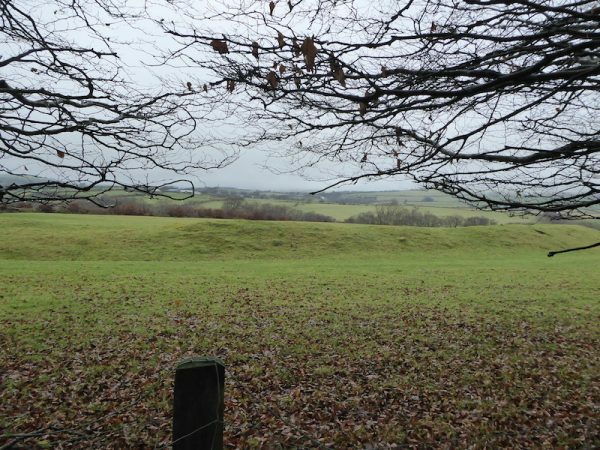 This track passes the Iron Age hillfort of Roborough Castle. The castle stands on private land so unfortunately is not accessible. The track now heads downhill towards Hoaroak Water, it is a stunning track. 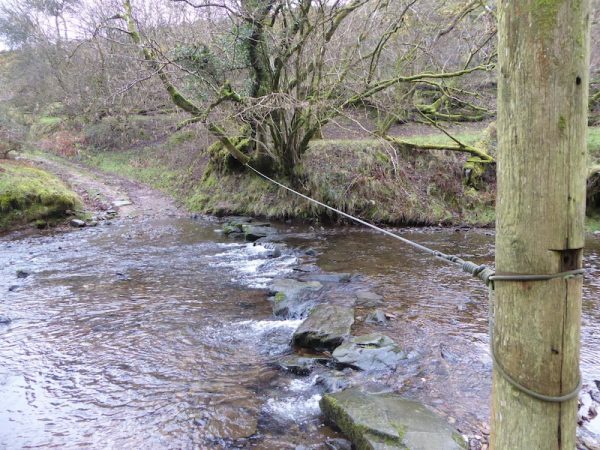 To cross the river there are rough stepping-stones with a guide rope. I manage to get across without getting wet feet, however, had the water level been any higher it would have been a challenging crossing. The route heads uphill on a farm track going through gates to reach a junction of tracks. Here I turn right along the route of the Two Moors Way and Tarka Trail towards Exe Head. The path is clear as it travels along the Cheriton Ridge, the visibility is now good so there are great views. 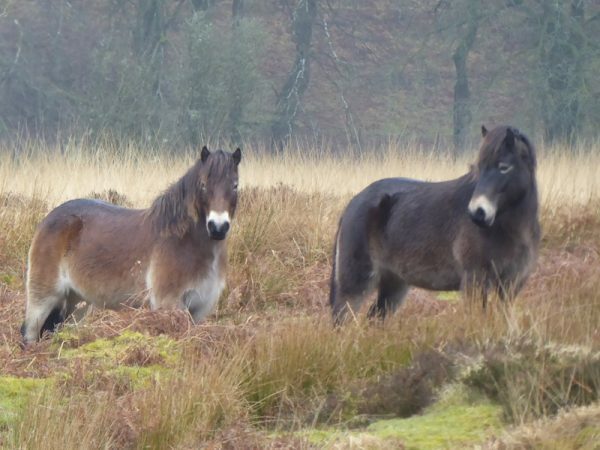 As I descend towards the Hoar Oak Water I pass a group of Exmoor ponies. I then reach the Hoar Oak Tree, apparently this tree is the latest in a long line of oak trees planted near this spot marking the boundary of the Forest of Exmoor and the commons of Lynton and Brendon. 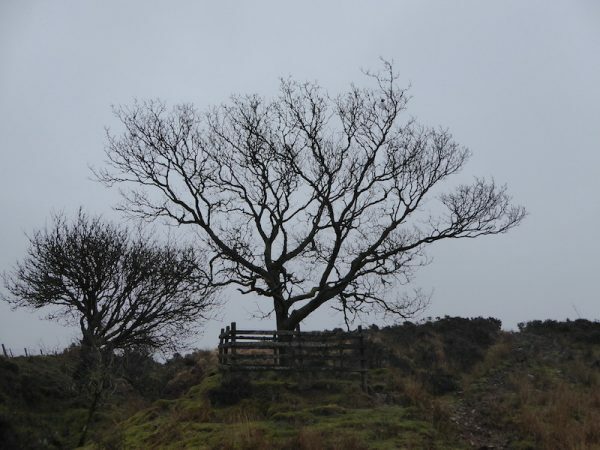 There are records of a Hoar Oak dating back to 1658 when an oak tree fell and was replanted in 1662. Accounts suggest a tree blew down in 1916. It is not recorded when the current tree was planted, but it is presumed to be close to a hundred years old. 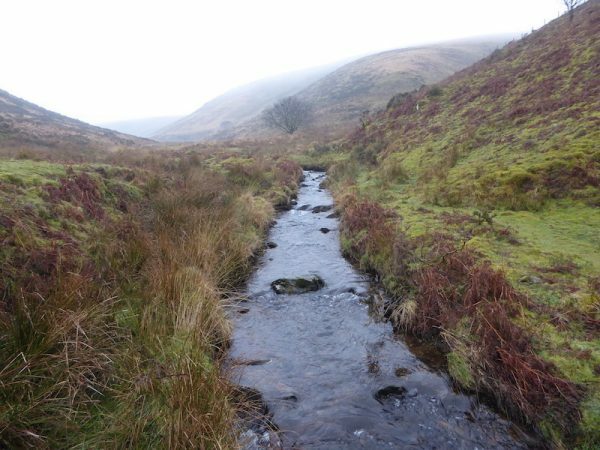 I now cross the Hoaroak Water and continue up the combe with the stream to my left. This is a stunning countryside that feels very isolated on a day like today. The path gradually climbs as I head towards Exe Head. Here I go through the gate and pick up the route of the Macmillan Way as it heads to Prayway Head. This is a stunning countryside that feels very isolated on a day like today. The path gradually climbs as I head towards Exe Head. Here I go through the gate and pick up the route of the Macmillan Way as it heads to Prayway Head. 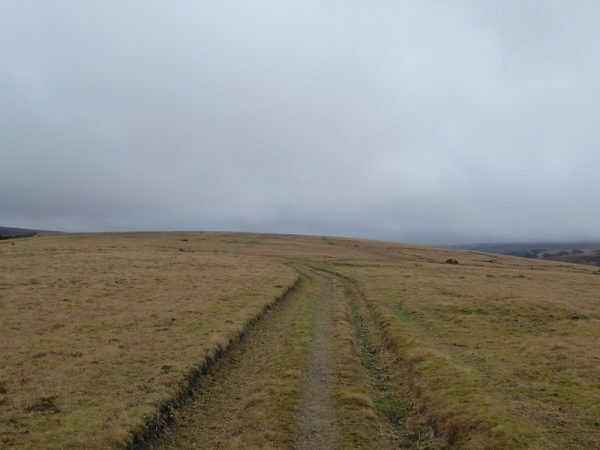 I am now following the path across the moor that I had struggled to identify earlier today. Heading in this direction it is clearer and easier to follow. 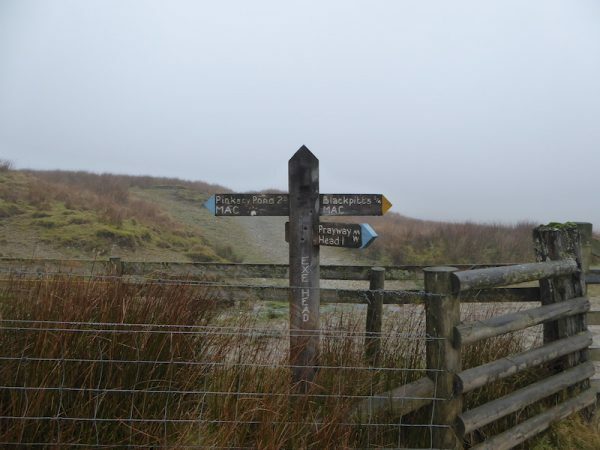 After crossing Dure Down moor I follow the route back to the car park. 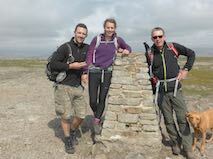 I have walked close to twelve and a half miles, the conditions and terrain have been a bit challenging but it has been a cracking walk. 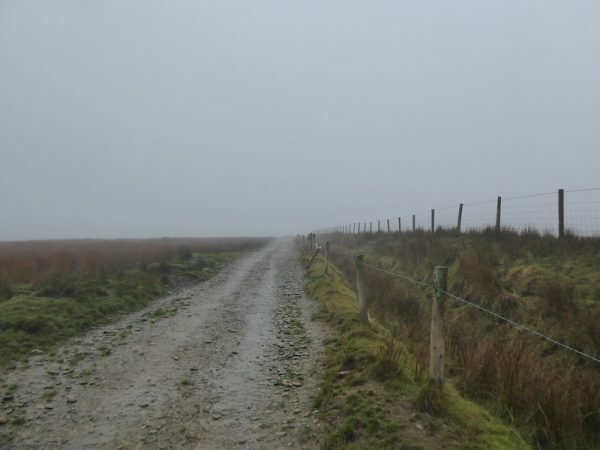 I will look for a day with better visibility before venturing up onto this section of moor again.